Thunderstorms don't stack on top of each other. Are you referring to a following storm cell? ..Ignore the halo out in front. And this is in Florida. Super cells in the Midwest will behave differently. The 2 lower parts are 2 different thunderheads. Stop it once in a while and take a close look. It's easier to understand this if you're there when it happens. Just one cell there. Get your eyes checked. Perhaps you are seeing double. Sure you posted up the correct storm? In the video you can only see 1/2 of ONE storm. There is NO view of the top to confirm two cells. I see one mature slightly outflow dominant supercell. What are you looking at? ...GasGuzzler, that it has 2 thunderheads is obvious. That's why there's a dark band between the upper and lower thunderheads and yet both you and itn missed this separation. At the same time you say there is no climate change. itn says that climate cannot be defined. See where I'm going with this ? About all you and itn have is discrediting other people because then this means that you must be right. Still, we're technically in an ice age because glacial ice touches the Southern Ocean in Antarctica and yet we're worried about how warm it's going to get ? See where I went with that ? ..And with this I did call it a Super Cell as well but it has 2 different thunderheads and when it rains those rains will be like 2 different thunderstorms. In the Midwest a Super Cell goes all at once. See where I went with that ? OK, now you're going to have to define thunderhead. I define it as a Cumulonibus cloud, which is a thunderstorm. A typical thunderstorm has a rain core below or lagging slightly behind forward movement. I only see 1/2 of a rain core in that video. ITN may be on to something. You are seeing double...or maybe even quadruple. ...GasGuzzler, that it has 2 thunderheads is obvious. That's why there's a dark band between the upper and lower thunderheads and yet both you and itn missed this separation. At the same time you say there is no climate change. itn says that climate cannot be defined. 'Climate' can be defined. 'Climate change' so far has not been defined. Pay attention. About all you and itn have is discrediting other people because then this means that you must be right. Still, we're technically in an ice age because glacial ice touches the Southern Ocean in Antarctica and yet we're worried about how warm it's going to get ? Now you are redefining 'ice age'. See where I went with that ? No, it doesn't. Get your eyes checked. and when it rains those rains will be like 2 different thunderstorms. A torrential rain is not like two different thunderstorms. In the Midwest a Super Cell goes all at once. OK, now you're going to have to define thunderhead. I define it as a Cumulonimbus cloud, which is a thunderstorm. a cloud forming a towering mass with a flat base at fairly low altitude and often a flat top, as in thunderstorms. ..What's in the video doesn't have a towering mass so it can't be your Cumulonimbus https://goo.gl/images/DW5C8P cloud. ..And now we're back to being in an ice age. ...itn, go to Florida one day. You'll see it doesn't constantly sprinkle like Seattle does. In Florida the video I showed most likely had 2 different periods of torrential rain. That makes it like 2 different thunderstorms because they are separated by time. Time is what a person is aware of when they're not getting stoned all the time. ..You seem to have no concept of time because of your religious faith. People who have impure thoughts like science or math should be stoned. I think you are a very religious person. Just my opinion. The top of that cloud, likely 40,000 ft tall or more, is obscured by the outflow section of that storm. You can't see the top....even if you are seeing double you STILL won't see it! ..You're making stuff up now. The video was a time lapse shot from a distance. There's nothing towering above it. You're screwing with me, right? If so, then well played. If not, well then you might need to learn to some stuff. WRONG. Cumulo means 'piled'. Nimbus means 'rain' (but includes any form of precipitation). A cumulonimbus is a rain cloud that has a 'piled' appearance, as opposed to a stratus, or 'flat' cloud. You might go study at least an introduction of meteorology. What's in the video is a cumulonimbus cloud. Just one. Thunderstorms do not stack on top of each other. ...itn, go to Florida one day. Been there, done that. Even been through a hurricane that hit Jacksonville while I was there. (Wasn't as strong as the last one was). You'll see it doesn't constantly sprinkle like Seattle does. In Florida the video I showed most likely had 2 different periods of torrential rain. That makes it like 2 different thunderstorms because they are separated by time. If that is so then there are two cells, but they are not stacked on top of each other. The video you showed shows only one cell. ...It shows one on top of the other. The dark area is the bottom of the top cell. I placed 4 large arrows pointing towards the bottom of the 2 thunderheads. That's why those areas are so dark. And I did say it is a Super Cell. There is a phenomena associated with thunderstorms that would allow this to function as a Super Cell that can become 2 different cells. This would explain why there is a different thunderstorm a little over an hour later from this same cell. ..I think with meteorologists they spend their time on hurricanes and tornadoes for obvious reasons. And from a meteorological stand point this is pretty cool. The 2nd picture is to a typical thunderhead which is common in the Midwest and is what GasGuzzler would be talking about. ..Ever hear of sprites ? They're the red flashes above this one. And with the heat lightning, the double thunderhead in Florida would/could be a more concentrated storm cell which would allow it to act like 2 thunderheads while being a Super Cell. Just a lot of energy involved and the lower part of the Super Cell could be feeding the upper part as I mentioned. The red sprites go up into space so the heat lightning could be going from bottom to top in this video. ..This link is to a picture I took of the Red Sprites. This will let everyone know when and where to look for them. Anymore I don't think either GasGuzzler or itn finds anything interesting. Neither of them have seen a storm cell produce 2 different sets of torrential rains. They can only go by the information they find online. The image I posted does show separation in a Super Cell and both have the dark bottoms of a thunderhead. Unique to Florida I guess. Then again the Gulf Stream is feeding it so that would explain why it would have different characteristics than a storm from the Gulf of Mexico unless it's near the coast. Sprites were accidentally discovered because it was believed that thunderheads never discharged any type of energy up into the atmosphere. ...This video has nothing to do with the weather but is still kind of cool to watch. ...It shows one on top of the other. The dark area is the bottom of the top cell. I placed 4 large arrows pointing towards the bottom of the 2 thunderheads. You are pointing at the 'anvil' of the cell. That's why those areas are so dark. No, the density of the cloud is why it's so dark. And I did say it is a Super Cell. There is a phenomena associated with thunderstorms that would allow this to function as a Super Cell that can become 2 different cells. This would explain why there is a different thunderstorm a little over an hour later from this same cell. That's a different cell, unrelated to the first one. ..I think with meteorologists they spend their time on hurricanes and tornadoes for obvious reasons. They spend their time on all weather. Even sunny days! The 2nd picture is to a typical thunderhead which is common in the Midwest and is what GasGuzzler would be talking about. The only difference is size. ..Ever hear of sprites ? Yup. Seen 'em too. They're common in most any intense thunderstorm. They're the red flashes above this one. Yup. You correctly identified them. That is not heat lightning. Look up 'heat lightning'. I grew up the desert. the double thunderhead in Florida would/could be a more concentrated storm cell which would allow it to act like 2 thunderheads while being a Super Cell. Nope. It's one cell. Just a very large cell. Just a lot of energy involved and the lower part of the Super Cell could be feeding the upper part as I mentioned. There is no lower cell and upper cell. It is one cell. Sprites are unrelated to 'heat lightning'. BTW, lightning is not heat. The term is misnomer. could be going from bottom to top in this video. Nope. Cloud to cloud lightning just travels sideways. ..This link is to a picture I took of the Red Sprites. This will let everyone know when and where to look for them. Anymore I don't think either GasGuzzler or itn finds anything interesting. Neither of them have seen a storm cell produce 2 different sets of torrential rains. That is two unrelated storm cells, not one. They can only go by the information they find online. Nope. I grew up in the desert. I've been through Florida hurricanes. I've experienced tornado activity near where I was standing. and both have the dark bottoms of a thunderhead. Unique to Florida I guess. Nothing special about Florida in this regard. Then again the Gulf Stream is feeding it so that would explain why it would have different characteristics than a storm from the Gulf of Mexico unless it's near the coast. Irrevelant. A storm is a storm is a storm. WRONG. Tesla observed them from his observatory near Pikes Peak. ...If ya'all have missed it, both itn and GasGuzzler have been supporting mainstream science. There is no such thing as 'mainstream' science. Science is a set of falsifiable theories, not a media or news agency. Mainstream science claims that there is climate change and global warming. There is no theory possible, scientific or otherwise, for undefined and meaningless buzzwords. You MUST first define 'global warming' and/or 'climate change' without using circular definitions. only one is on top of the other. Thunderstorms don't stack on top of each other. Could explain why the thunderstorm comes from the lower part of a Super Cell while the top part of the cell behaves differently/has different winds. A thunderstorm IS the cell. They work together in their own way. ..This gets old itn where you post like you're an obsessive-compulsive. In the end it's meaningless yet you get off on it. It's an addiction to you, isn't it ? What gets old is you, in typical liberal fashion, can no longer stand on your statements and then resort to attacking the person and not the argument. Tell me something James...we got hail here today and it was 90 degrees out. Now how the "hail" did that happen? ...gasguzzler, I'm not a liberal. This is a liberal policy. ...I'm not in here to discuss politics. I'll repost the image of a traditional thunderhead. The area between the 4 arrows is the thunderhead. ...The area above it which is all nice and white and fluffy is because something else is happening. I'll let itn explain this with his conservative policy. The difference between that area and the area above should be obvious. If not then I must be seeing double or quadruple, right gasguzzler ? ...Mainstream science claims that there is climate change and global warming. ...Why do you require what "is" to be defined ? ...Define "cell" without using circular definitions. ...They work together in their own way. Cumulonimbus is a dense, towering vertical cloud, forming from water vapor carried by powerful upward air currents. If observed during a storm, these clouds may be referred to as thunderheads. ..In the meantime gasguzzler and itn can give their thoughts on this phenomena if they feel like it. You're a liberal...even by the definition you just gave. ...I'm not in here to discuss politics. You're here to insult people and push your bizarre religion on others as 'science'. I'll repost the image of a traditional thunderhead. The area between the 4 arrows is the thunderhead. ...The area above it which is all nice and white and fluffy is because something else is happening. I'll let itn explain this with his conservative policy. The difference between that area and the area above should be obvious. If not then I must be seeing double or quadruple, right gasguzzler ? ...Ice what ? I think everyone knows that hail is associated with thunderstorms in the Midwest. A vague reference about an effect of a Midwest thunderstorm is not an answer. We're back to my saying you find nothing about our environment interesting. It's a good thing that you're not Native American because I've always have heard that Native Americans are naturalists. They care about nature. You seem to have no such desire about you. The area above is all nice and fluffy because it's ice. Seriously, don't you know ANYTHING about clouds? Hail can pound Florida too, not just the Midwest. Guess what? it forms from the same process, anywhere in the world. The only thing different may be what is causing the tremendous lift. Believe it or not, it has NEVER been caused by stacked super cells. 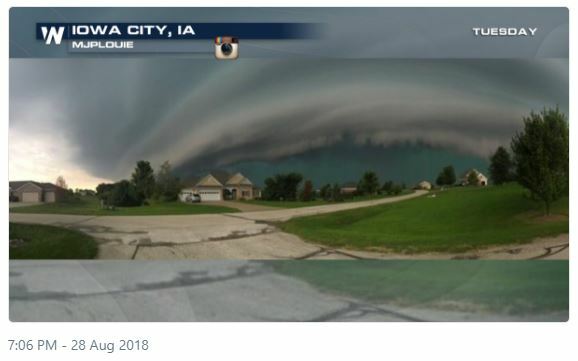 By the way, what you point to in your picture is just the shelf cloud with a couple striations. The actual rain core is a mile or two south of it. ...and don't tell me I don't appreciate nature. This is the storm i was chasing just last night. 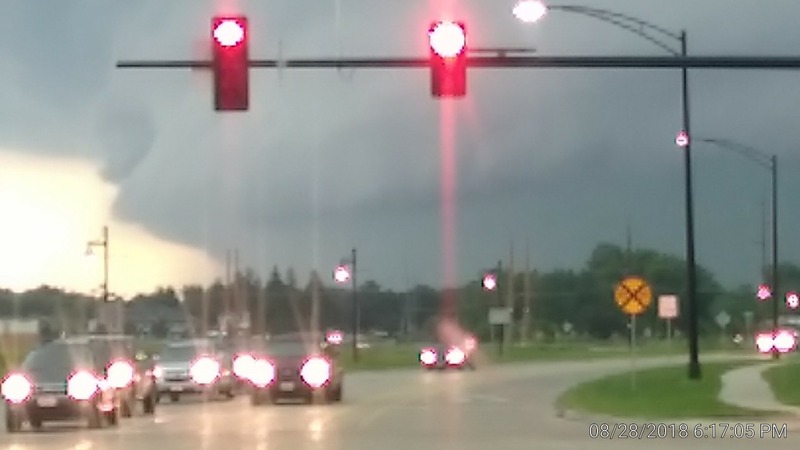 I left work just about ten minutes late as this was looking south with a 60mph eastward storm motion. Storms are my passion and I've spent shitloads of too much money driving to see them. (1039) it's cool posting from TV. I like the way that you're answering for each other. I've heard that couples do that for each other. Are guys gay? It's okay if you are. Actually it's kind of sweet . it's cool posting from TV. I like the way that you're answering for each other. I've heard that couples do that for each other. Are guys gay? It's okay if you are. Actually it's kind of sweet . Yeah dumbass, the TV always has a date stamp and time stamp on the bottom right-hand corner. What about you and ITN? ..If anyone downloads the picture they should be able to see it is this post. Took a picture with my smart phone, emailed it to myself then downloaded it on to my p.c. After clicking on the link click on the picture and you'll see climate-debate in the browser. Click on the magnifying glass and the last sentence will be (difficult to read) What about you and itn? ..I think I like posting better on my TV though. Try hurrying or getting worked up over something just isn't going to happen. That's the problem that itn and gasguzzler have, they get worked up when there's no need for it. (1107) My bad, I thought you were trying to say I didn't take the pic and stole it off the TV. I guess you were just rambling on about nothing again. Sorry. This is the same storm looking west at around the same time...and the view I wanted to get...and I just realized my camera is an hour off on the time. I did steal this one off the web. How many supper cells are stacked in this one do you think?? ..It has a date and time stamp in the lower right corner which he says the TV always has. He sure knows what he's talking about. (1039) ..Since it's close enough to Friday. Heat is removed from the thunderhead which is why there is an updraft. This is why hail can form when barometric pressure is low enough. Thermodynamics states that heat flows from warm to cold yet in a thunderhead there is that updraft of warm air from the cold thunderhead. Something for itn and gasguzzler to consider. ..With me makes me kind of think that water molecules might create a stronger bond in a Joules-Thomson field. Then again at some point they might bind which basically means they could start sharing electrons. Kind of what research is for. To understand how the adhesive properties of water molecules might be efficiently reduced for engineering purposes. Stuff like that isn't for this forum though. Heh. Everyone needs a hobby! I too like to see a good storm. You kinda miss it with the drizzle around Seattle most of the time. My bad, I thought you were trying to say I didn't take the pic and stole it off the TV. That's a neat cloud formation. It looks like the arc of doom. ..Since it's close enough to Friday. Heat is removed from the thunderhead which is why there is an updraft. WRONG. A thunderstorm IS heat. This is why hail can form when barometric pressure is low enough. WRONG. Hail can form anytime there is rapid cooling of moist air by convection. Thermodynamics states that heat flows from warm to cold yet in a thunderhead there is that updraft of warm air from the cold thunderhead. Something for itn and gasguzzler to consider. The updraft out of the top of a thundercloud is the same temperature as the thundercloud itself. It is moving into yet colder air. ..With me makes me kind of think that water molecules might create a stronger bond in a Joules-Thomson field. There is no such thing as a Joules-Thompson field. The bond strength of water is the same regardless of any Joules-Thompson effect. Then again at some point they might bind which basically means they could start sharing electrons. Kind of what research is for. They are already bound. That's why we call it water. To understand how the adhesive properties of water molecules might be efficiently reduced for engineering purposes. Stuff like that isn't for this forum though. Water tension doesn't change unless you contaminate it with something. Field; An area rich in a natural product, typically oil or gas. ..What makes this sad is that you are the one who insists on defining everything. At the same time you say we already know everything. This makes you a Flat Earther. Believe it or not, it has NEVER been caused by stacked super cells. ..I never said it was. This is almost funny. If you and ITN would've been alive in 1900 both of you would've said powered flight was impossible, breaking the sound barrier would've been impossible and everything we have today you'd say it was all science fiction. You guys are like my nephews when they were about 10. They didn't believe me when I told them that there was a time when phones had to be dialed with a round dial and there were no video games. They thought I was making things up. Inversion fallacy. Insult fallacy. Redefinition fallacy. Not at all. Gliders were around for quite awhile at the time, and birds fly using powered flight. Not at all. It was difficult, and new designs had to deal with the flutter issues, but people like me kept at it. and everything we have today you'd say it was all science fiction. What 'everything' are you talking about? Things like semi-automatic driving cars, the Alexa services, flat TV's? Microprocesors? It WAS science fiction in 1900. You guys are like my nephews when they were about 10. They didn't believe me when I told them that there was a time when phones had to be dialed with a round dial and there were no video games. They thought I was making things up. Inversion fallacy. You are like your nephews. It is YOU that thinks theories of science are 'made up' and don't count for anything. Yeah, very cool. The odd part of this was it was not so much a super cell, but more of a squall line with a kink. It was tornado warned, which is somewhat of a joke. I really don't know why they bother with warning QLC tornadoes. They're almost always rain wrapped so they are rarely spotted, and the straight line winds almost always outpace the "tornadic" winds. That was the case Tue also. There was an F-0 with 80 mph wind and there was straight line measured at 90. At 60mph forward storm motion, what's the difference? Not much. ... of course reading some of the social media, there were the typical idiots blaming climate change for a run of the mill Midwest severe storm. Do they have any flipping clue how much COLD air was involved in the birth of that storm?! !